In the September, 1956 issue of Mechanix Illustrated, directions for a lightweight, wooden speedster powered by a motorcycle engine caught the eye of some deranged boat builder on the west coast. Here's the result: a modified version of the Speedball Special. Best news? It's for sale. The car was originally built in 1959 and is equipped with an impossibly rare 1952 Ariel Square Four motorcycle engine, a smooth-running four-cylinder 1000 cc engine able to push out about 42 HP. That might not seem like much, but when driving the sequential four-speed and with a weight of only a mere 750 lbs this little wooden car has got to be a rocket. The car seems fairly true to the original, with an independent suspension from a Citroen (three lug wheels! ), single wheel drive, a Renault steering box, and various pieces of brightwork from a Cadillac. Cool barely even describes the car and it's hard to believe anybody would want to sell it.The listing is up on eBay and at the time of posting it's current price is sitting at $22,456 with a measly buy-it-now price of only $29,000. That's dangerously close to sounding like a reasonable price for some magnificent workmanship on a very unique and hairy-knuckled roadster. A SOLID WOOD CAR!! RARE ARIEL SQUARE FOUR ENGINE! A ROLLING PIECE OF ART THAT WILL SURELY COMPLETE ANY COLLECTION! !A truly One of a Kind work of automotive art! 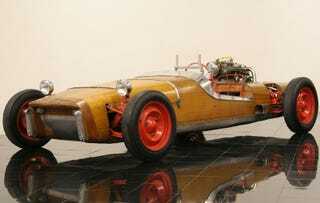 Built by a west coast boat builder in 1959, this awesome wood car will complete any collection. The story behind the car is that the builder wanted a unique hotrod, one that reflected his superior woodworking skills along with his knowledge and love for boats. He started by building a wood body modeled after a Modern Mechanics Magazine article, then he sourced out an ultra rare 1952 Ariel Square Four motorcycle engine and transmission for the power. The suspension was taken from a Citroen of the era, and rest was all hand fabricated. Many parts are period correct new car pieces, the taillights are Cadillac, the headlights are generic part store replacements, and the fuel cell is a California Speed shop special. Driving this car is an experience only a lucky few will ever have. Starting the engine is easy, just turn the key. The pedals are like that of a normal car, the shifter is a sequential 4 speed, braking is done by four wheel hydraulic drum brakes. The real fun is cruising around town and seeing the looks on people's faces, accelerating thru the gears is exhilarating, but the car stays stable while doing so. The exhaust note is fantastic due to the hand built side exit pipes. Proper running lights for legal street driving where installed when the car was built, however comforts like climate control are absent. After building and driving the vehicle for a short time the builder put the car in storage, and later sold the car to a Nevada Collector. The car remained in the care of that collector until it was purchased by a friend of the museum during a Rare Motorcycle hunting trip to Vegas, shortly after the car was transported to St. Louis it was sold to the Museum. It is important to note the original condition of the vehicle, the high build quality and excellent care the car has received over the years has preserved it very well, a piece of Americana from a similar time of innovation and individual creativity. The car does have a clear Missouri title as a 1952 Ariel and carries the VIN from the motorcycles engine. Please do not hesitate to contact us about this rare opportunity to purchase this spectacular motorcar. If nothing else it is truly fun to show your friends the new piece of art you just acquired.